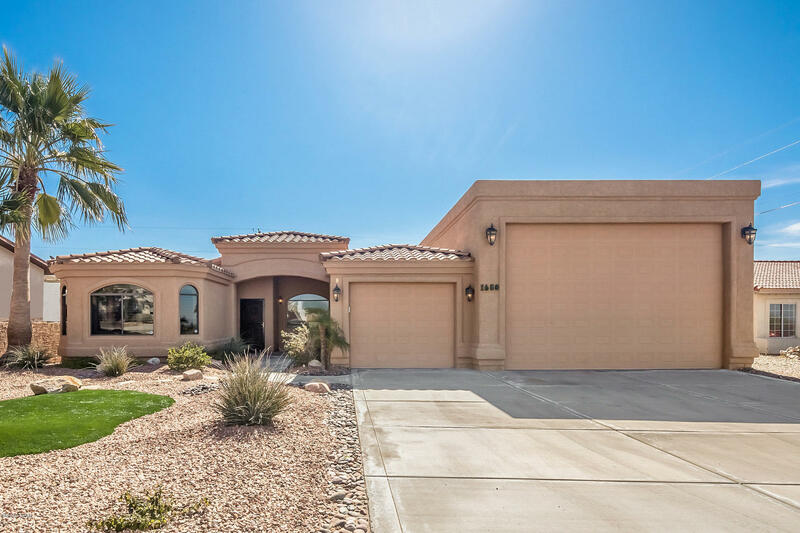 GORGEOUS FORMER MODEL HOME w/tons of upgrades, DOUBLE RV GARAGE AND SIDE RV PRKNG, located on the South End of Lake Havasu w/Easy Access to Offroading, Hiking, Mountain Biking and SARA Park Events/Activities. This Beautiful Open Living Floor Plan has 1,779 SF w/3 Bdrms, 3 Baths along w/1,550 SF of Garage Space for RV and Toys Making this a 3,329 SF Home Under Roof! The Gourmet Kitchen has Beautiful Knotty Alder Custom Cabinetry, High End Stainless Appl. w/Frigidaire Galley Induction Cooktop Range, GE Built-In Combo MW/Thermal Wall Oven, Jenn Air Stainless TriSensor Refrigerator, RO, Jenn Air Energy Star Dishwasher, Oversized Pantry, and a Gorgeous Entertaining Granite Bar. There is Spacious Seating for Casual Dining, Solar Can and Recessed Lighting w/Vaulted Ceilings, and Plantation Shutters Throughout. The Master Suite is Amazing Too w/Slider to Patio, Double Door Entry To Masterbath w/ Walk-In Tiled Shower, Dual Vanities, and Dressing Room Sized Classy Closet. This Home Sits on a huge 80x150 Lot w/Block Wall Fencing. The Huge Backyard and Extended Covered Patio are South Facing for Enjoying the Arizona Sunshine. This Home has all of the Furniture Avail. Making it Move-In Ready. Directions: Hwy 95 to McCulloch Boulevard South to Property Past Tioga on the Left.